Supporters of opposition NASA have take to the streets this Monday to demand the sacking of electoral commissioners ahead of 26th October re-run vote. In some NASA’s strongholds of Kisumu and Siaya, security forces fired tear gas to disperse demonstrators, as they burnt car tires on the roads. The opposition flag bearer, Raila Odinga, called for the demonstrations that have also been reported in the capital Nairobi, last week. Odinga revealed that same protests will take place twice a week until the demonstrators’ demands are met. “We have no other option but to take the battle to the people,” Odinga said on Thursday. “I call upon on this generation to resist. They must arise and resist an attempt to try and take them back to the eras of single-party dictatorship. We are calling our people to action,” he added. 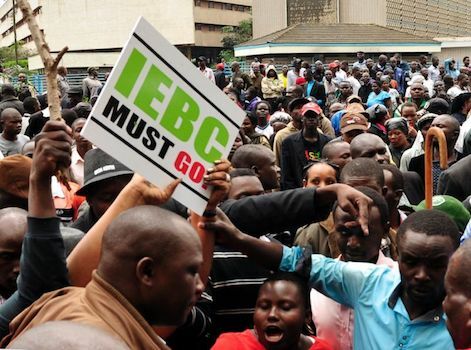 These protests come amidst President Uhuru Kenyatta’s Jubilee party, tabling before parliament a proposal to prevent the country’s Supreme Court from annulling the results, among, other electoral reforms.